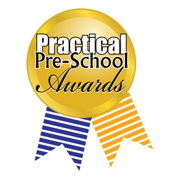 The Practical Preschool Awards take place annually and are designed to identify and reward excellence in toys, books and other educational resources for children up to eight years old. Practical Preschool is the respected publication for the Early Years Foundation Stage. It is published monthly and regarded an essential resource for anyone working within a preschool environment. As well as the magazine, Practical Preschool also publishes numerous books, newsletters and educational resources. The Practical Preschool Awards features a scrupulous panel of childcare professionals and, perhaps most importantly, children! All products are judged on a strict set of criteria that includes durability, educational value, play value and value for money. Any product that receives a rating or 90% or more is awarded a gold medal. Those products with 80%-89% get silver and 70%-79% getting bronze. There is also an overall winner for each category.